The Kremlin's international media operation appears to be going from strength to strength with two recent high-profile launches and more in the pipeline. But it is also coming under increased scrutiny over its lack of editorial balance and accusations that it is deliberately using disinformation to counter and divide the West. In a spanking new press centre in Moscow on 10 November, controversial TV news anchor Dmitry Kiselev, who is also head of the Rossiya Segodnya (Russia Today) news agency, unveiled Sputnik - the Kremlin's latest foray into the international news arena. 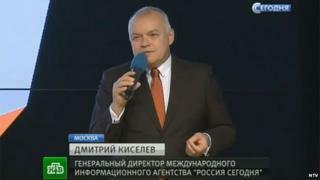 Kiselev said the new project was aimed at a global audience "tired of aggressive propaganda promoting a unipolar world and who want a different perspective". But with his own relentless denunciation of the West and demonisation of Ukrainians as fascists on state TV, there can hardly be a more practised purveyor of "aggressive propaganda" than Kiselev himself. The Sputnik launch came less than a fortnight after the Kremlin's international TV channel RT (formerly known as Russia Today) unveiled a dedicated news service for viewers in the UK. Editor-in-Chief Margarita Simonyan (who holds the same position at Rossiya Segodnya) said that RT UK would seek to "promote debate and new ways of thinking about British issues". RT's funding is set to rise in 2015 to over $330m (£210m; €264m). It is said to be planning to add French and German operations to its existing services in English, Spanish and Arabic. But RT UK's debut was greeted with a barrage of criticism in the British press. Writing in the Observer, Nick Cohen accused the channel of spreading conspiracy theories and being a "prostitution of journalism". Meanwhile, in The Times, Oliver Kamm called on broadcast regulator Ofcom to act against this "den of deceivers". Oliver Kamm did not have long to wait. On 10 November, Ofcom found RT guilty of violating the broadcasting code's "due impartiality" rules in its coverage of the Ukraine crisis in early March. It rejected RT's contention that as a station that challenges the "established" view in the UK it was somehow exempt from the normal broadcast requirements. In view of past violations, it put the channel on notice that future breaches may result in a "statutory sanction", which could include fines, or even the suspension or revocation of RT's broadcast licence. For President Putin, RT is spearheading Russia's bid to challenge the "Anglo-Saxon monopoly" on global news. But, according to a recent report by US journalist Michael Weiss and UK-based writer and TV producer Peter Pomerantsev, it is part of a strategy of disinformation aimed at countering and dividing the West. Entitled "The menace of unreality: How the Kremlin weaponises information, culture and money", the report was produced under the aegis of the US-based Institute of Modern Russia (IMR), which is part-funded by members of the family of former oil tycoon and Putin opponent Mikhail Khodorkovsky.. Adapting techniques inherited from the old KGB, say the authors, RT makes extensive use of conspiracy theories that serve to undermine a "reality-based discourse". This, they argue, then creates the conditions in which the Kremlin can advance its own disinformation to "confuse situations at critical junctures". They give as examples a spurious RT report about Jews fleeing Ukraine over anti-Semitism, equally bogus insinuations that a US think tank was advising Ukrainian President Poroshenko to carry out ethnic cleansing, and the spreading of conspiracy theories concerning the downing of Malaysian airliner MH17 over east Ukraine in July. According to Weiss and Pomerantsev, this kind of media manipulation amounts to a "weaponisation of information", a phrase also used in relation to Russia by Mark Galeotti, a professor of global affairs at New York University. But Ms Simonyan insists that RT is not very different from other major news broadcasters. Responding to the Ofcom ruling, she said the BBC was also guilty of "bias" in its reporting of Ukraine, as well as its coverage of other issues. In a statement posted on RT's website, she said other broadcasters would also have to change the way they operate, "if double standards are to be avoided". Weiss and Pomerantsev, meanwhile, came under fire in an anonymous article on the pro-Kremlin English-language website Russia Insider. Part political critique, part personalised attack, the article accuses them of being members of a "Russophobic hack pack" that also includes Edward Lucas of The Economist and US journalist Anne Applebaum. Ordinary Russians appear to hold similar views. A poll published on 12 November by the independent Levada Centre indicated that 88% of the population believe the USA and other Western countries are waging an information war against Russia. Just 4% dissented from this view.